This week in the Spotlight we were joined by B.K Bass, speculative fiction author of Kyanite Publishing to talk getting published, worldbuilding and writing. The Spotlight takes place on the WorldAnvil Discord server, with the community invited to talk to an author with the spotlight host. This week it was hosted by Community Spark Qurilion. 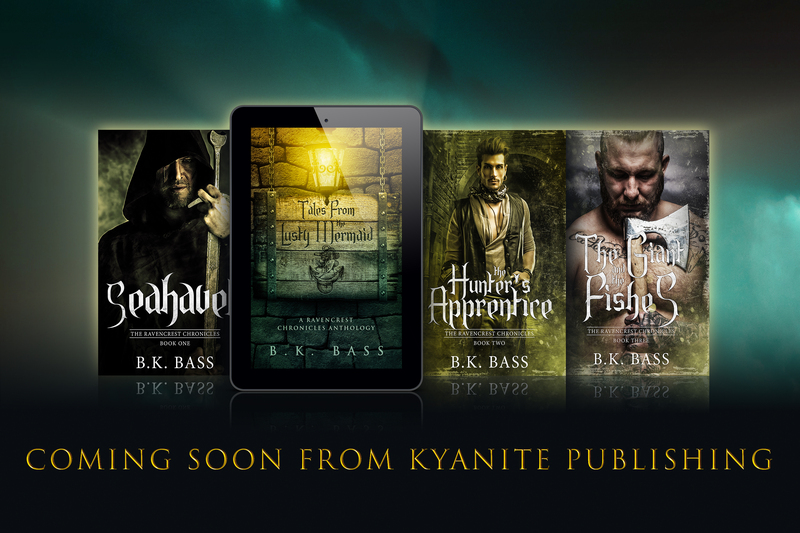 B.K Bass has published five books (four novels and an anthology) and is the managing owner of Kyanite Publishing. I’ve been an avid fantasy and science fiction reader, tabletop RPG gamer, and all-around geek for about 30 years. I’ve dabbled in writing fiction off and on for that long, but made it a full-time endeavor in the past year. I’ve published five books so far (four novellas and an anthology), four of which are being issued as revised editions and as an omnibus early next year. I also am a managing owner of Kyanite Publishing and act as acquisitions director, managing editor, and editor-in-chief of our bi-monthly speculative fiction journal: the Kyanite Press. That’s pretty dang impressive! Are those books traditionally published or self-published? My first four books (the first four volumes of The Ravencrest Chronicles) were self-published, and are the four that are being re-issued as second editions by Kyanite Publishing. The fifth, Night Shift, was first started as a project on Wattpad; but has since been published by Kyanite Publishing. What do you like most about your writing? What do you feel proudest about when handing someone your book? Thank you! I think my favorite thing about my own writing is being able to transport my readers to new worlds. I’ve been complimented both personally and in reviews that I’m able to paint a picture in the minds of the readers. I’m proudest of simply having created something new! Do you have a World Ember wordcount goal? I plan to hit the 10K base goal, but am hoping to hit the 50K goal for the ‘Novel’ badge. Whether I accomplish that or not is yet to be seen! How do you go about worldbuilding for your novels and what are the main things you would tell anyone building their world with a story in mind? I’ve taken two approaches. Sometimes, I just write the story and let the world grow around it; other times I craft the world before I write. It depends a lot on the scope of the work and required complexity. If the setting will be small and simple, I just write. I always have a story in mind first before I worldbuild, but sometimes new stories grow out of the worldbuilding. It can be a very organic process where one side of the coin inspires the other. Usually the FIRST things, no matter what, are the genre and tone. With my Erimos world, for example, I knew I wanted to emulate the style of Robert E. Howard’s Conan in an Arabian-inspired setting that was a world covered in deserts. With my Ravencrest Chronicles books, I was going more for dark urban flintlock fantasy – but it ended up with a nautical feel after the world started to grow; so that is a good example of the two aspects feeding each other. Which brings me seamlessly to my next question: What comes first – setting, character, or plot? Do you pick a genre to write a story in, or does the story come to you and determine what the setting is? I usually pick the genre first. Studying different sub-genres of speculative fiction is a fascination of mine, and as a result it’s become my self-proclaimed (and peer recognized) area of professional specialization. (I have written some genre study articles for my own web site, and I write a column on the subject for the online portion of the Kyanite Press.) Once I’ve figured out the genre, the plot is the next step for me. Many experts will say to focus on character, but I follow the old pulp fiction method of generating plots first. Often, my characters will grow organically during the writing process. I like to joke that I write what the voices tell me to! How do you structure your writing? Where do you stand on outlining vs discovery writing? What is your creative process for getting there? What does your writing environment look like? It is very fixed and scheduled, or more whenever you happen to have the time? A quiet environment, alone, with no distractions. Soft instrumental music appropriate to the genre, or jazz as a go-to in any situation. Plenty of coffee. Often, writing is a morning exercise for me; but sometimes I’ll have late-night bursts of inspiration. My partners and I have scheduled ‘writing days’ for ourselves so that we can set aside the publishing business and work on our own projects three days a week. When I do write for a full day, I’ll usually do two or three four-hour blocks with two-hour breaks in the middle. Pushing the mind often leads to diminished quality, so one sees that writing marathons are rarely as productive as they seem once you get to the editing process. Doing a couple of hours a day often nets better results. Outside of sitting down to write, a writer can always be working. Staring at a wall counts, depending on what’s happening inside your mind. I’ll often try to work out an entire scene in my head before I even sit in front of a keyboard. What are the inspiration for your settings and stories? In particular, The Burning Sands and Erimos? What books, authors, movies and so on? In general, I’m inspired by a lot of the classic authors of speculative fiction. I have had work compared to Fritz Leiber (The Ravencrest Chronicles), Robert E. Howard (The Burning sands), and a fusion of H.P. Lovecraft and Robert Conan Doyle (Beyond the Veil). These authors were the inspirations for these projects, so those comparisons are a sign of artistic success for me! The Burnings Sands – the series associated with the world of Erimos mentioned above – is inspired by the work of Robert E. Howard with his Conan stories. Also, developing this project is a focused project inspired by a chapter in James Scott Bell’s “How to Write Pulp Fiction” called ‘The Pulp Fiction Writer’s Insurance Policy.’ Bell details the importance of having a strong serial character that does not have a character arc – one that the author can generate one story after another focused on plot to develop a long-term following of readers. Brego, the protagonist of The Burning Sands, is my insurance policy. I’m planning to write a lot of books with him in them! How did Erimos and those stories develop? As I mentioned before, I had in the back of my mind James Scott Bell’s theory of a pulp writer’s insurance policy. I had Conan in mind for an inspiration, but wasn’t sure how to take that and make it something original. I was participating in a Twitter-based author chat session (organized by @storysocial, every Wednesday evening) in the beginning of the summer that was focused on summer themes. Over the course of the discussion I didn’t have much to add because I didn’t have experience with seasonal themes, but then I was asked IF I were to do something, what would it be? Off the top of my head, I mentioned doing a secondary world covered in deserts where there are no seasons – it’s just hot all the time. A little spit-balling lead to Arabian influence and the sword and sorcery genre, and the feedback from my peers was an overwhelming insistence that I develop the idea further. I linked that with the aforementioned ‘insurance policy’ ideas, and The Burning Sands was born! How are you using World Anvil to help organize your novel-worldbuilding? I’m finding WA to be a great place to keep character and setting notes organized and displayed in a pleasing manner. I also love sharing my worldbuilding, so the presentation factor is a huge plus. I’ve always organized my worlds in an encyclopedic manner, even back in the day when it was on notebook paper in 3-ring binders. WA is the perfect platform to accommodate that! How do you keep still coming up with new fresh good name, even after this much writing? That’s actually a huge challenge! I spend a lot of time just sounding things out. My domestic partner / girlfriend thinks I’ve gone mad sometimes because I just spout garbled nonsense at the wall for hours. Also, I like to draw some inspiration from other languages like Old Norse or Latin, mythology, etc. You mentioned that you’ve published five books, but also that you’ve actually started a publishing company. Starting a publishing company isn’t a very typical path for an author to take. How did that come about? This is the crazy part of my story, because I never planned to do anything like this. An acquaintance on Twitter mentioned starting an indie book review site and publicly asked if anybody was interested in helping out. I figured I was reading some indie books anyway, so why not. A third partner joined her – actually a friend of mine but we had no idea each other had volunteered! In the process of reading and reviewing these books, we saw a lot of amazing talent that was struggling to get noticed. We discussed our frustrations – as one does – with the oversaturation of self-publishing and the inaccessibility of traditional publishing. The thought occurred that somebody could create a publishing company using a traditional model and a tightly controlled budget to take chances on the authors that the big guys might not take chances on. Then we decided we could be those people given the three of us already had diverse professional backgrounds in business management, accounting, marketing, and public relations; and Kyanite Publishing was born! What do you include in a query letter? What do you want to see in one coming to your publishing company? Every publisher is different on this, so if you’re going to query you definitely need to check their guidelines. What I like to see is a brief introduction of the author themselves (a book contract is a long-term relationship, let’s get to know each other), a good elevator pitch of the book (tell me WHY I want to read it), a SHORT synopsis of the plot (I need to know what happens in the book, but I don’t have time to read a 2,000 word synopsis of every submission. I want to know within 5 minutes what this is all about), and what you feel sets the book apart as far as marketability, exploration of themes pertinent to today’s audience, etc. Also, make sure to include all of your contact information, name, pen name if applicable, and links to any online presence such as your own website or social media presence. You would be surprised how many times I’ve gotten submissions with no information at all other than “Here’s my story, hope you like it.” That isn’t going to sell your story! And finally… The million dollar question : are you making a living as an author currently? Do you have any advice for those who have that as their desired career path? We hear a lot of doom and gloom about starving artists, and I’m not sure that’s always helpful. I think it is helpful to be realistic. The Guardian published an article in June of this year that stated that only 13% of professional authors – worldwide – make a living income on writing alone. Most authors write for the love of the craft and if they are lucky might supplement their income. The average self-published author on amazon makes between $500 – $1,000 USD annually. A traditional contract for a first-time author might pay an advance of between $1,000 – $10,000, but this must be paid back either from sales or from the author’s pocket! The best way to avoid the ‘doom and gloom’ is to make sure you are writing for the right reasons. If you are writing hoping to get a multi-million-dollar movie deal and be the next J.K. Rowling, you are setting a very high bar for yourself. Do I hope that this happens to me? Hell yeah! Do I expect it to? Nope. Is there a chance it could happen to me, or one of my authors, or you? Yes. Write because you love to write. Tell a story you want to tell. Send the message that you think the world needs to hear. If you make money doing it, that’s a bonus. Writing is art, and art should never be about the money. Am I making a living as an author and/or publisher? It’s bad timing to ask that, because we are just launching our first few projects. As we move through releases in 2019 and have a larger catalog of available products for sale (including quite a few of my own titles – all of which are on the same royalty agreements as all of our authors), I’d love to revisit that question. If I’m making enough to buy groceries, I’ll be happy. Anything else is gravy. We hope you enjoyed this spotlight roundup. Check out B.K Bass’ world of Eramos on WorldAnvil for more reading. The spotlights are on hiatus for WorldEmber – but if you want to join in on our next spotlight and offer your own questions, join us in the WorldAnvil Discord! Meanwhile, go check out WorldEmber for your December creativity needs. WorldEmber is the December worldbuilding challenge, challenging you to write 10,000 words of worldbuilding in a month. Read all about it here! Kyanite Publishing is joining us as a WorldEmber sponsor, and there are awesome prizes to be won. NextWorldbuilding Magazine December Issue: Magic!